With Over There! the London English Song Festival returned to Wilton's Music Hall for a further programme exploring World War One through music and readings, this time combining popular song and art songs themed around the entry of the USA into the war in 1917. Pianist William Vann, artistic director of the London English Song Festival, was joined by mezzo-soprano Katie Bray, tenor Nick Pritchard, baritone Craig Colclough, viola player Louise Williams and reader Richard Bryan for a programme which included popular song by George M Cohan, George Fairman, Ed Nelson & Will Hart, and art songs by John Ireland, Ivor Gurney, Charles Ives, and Ian Venables. As with their 2016 programme Songs of the Somme! 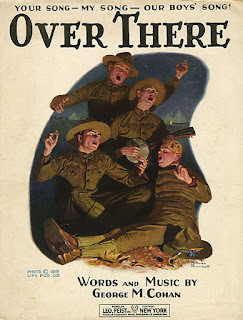 (see my review), this was a staged recital with the three singers in military fatigues. We opened with Woodrow Wilson's speech to Congress on 2 April 1917 taking the USA into the war underscored with The Star Spangled Banner on the piano, followed by a sequence of popular songs which captured the upbeat mood, the most famous being George Cohan's Over There, but also George Fairman's I don't know where I'm going but I'm on my way and Ed Nelson & Will Hart's delightful When Yankee Doddle learns to parlez-vois Francais. There followed a section which explored the British experience, with settings of Rupert Brooke and Edward Thomas, and a reading of Alan Seeger's moving I have a Rendez-vous with Death. Rupert Brooke's The Soldier and Edward Thomas' Lights Out are such well-known, powerful poems that I had the rather unworthy thought that neither John Ireland's setting of The Soldier nor Ivor Gurney's setting of Lights Out completely captured the mood of the poem. 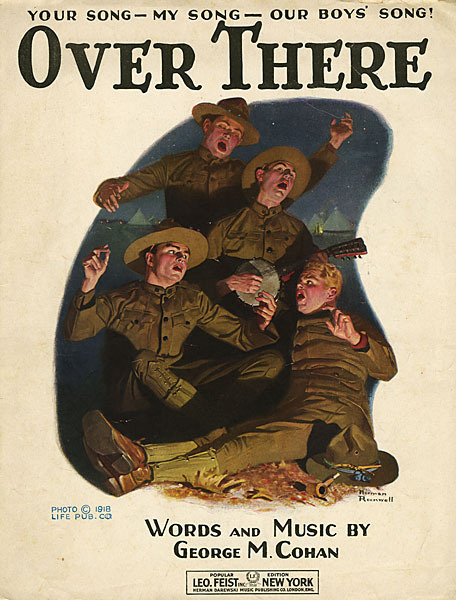 Intriguingly Charles Ives was present in a trio of songs which he wrote during the war, which moved from the sentimental In Flanders Fields (setting John McCrae) through to poignant Tom Sails away to the down-right upbeat He is there, though this latter was probably intended as an ironic comment on the jingoism of war and that was how the song was staged, the extreme contrast between the upbeat mood of the song and the realities of experience in the trenches. It was this reality which dominated the final sections of the evening, with John Ireland's In boyhood paired with his piano solo For Remembrance and Wilfred Owen's poem Strange Meeting, far longer and darker than the version set by Britten in his War Requiem. Ian Venables Suicide in the Trenches setting Siegfried Sassoon, and If you forget setting Geoffrey S Kennedy (both with viola from Louise Williams) provided a powerful modern take on the futility of war, complemented by John Ireland's A Garrison Churchyard and The Cost. The evening ended with an excerpt from Howells Elegy for viola and piano, and Wilfred Owen's Anthem for Doomed Youth. This was a powerful and movement evening, with the choice of songs and readings providing interesting counterpoints and the arc of the drama progressed from American idealism through to ultimate disillusion. All performers gave strong, highly involved performances with the singers sharing the songs between them and remaining involved and in the moment even when not singing. As well as the three public performances (the final one is tonight, 20 July 2017), there are two schools matinees and an Eductional Matinee Cover Art Competition with the winner's design printed in the programme.